Charleville Castle is one of the most finest gothic-style castle in Ireland, built by the Earl of Charleville, Charles William Bury (1764 -1835) under the inspiration of his artistic partner, Lady Catherine Marie Charleville in 1798. It was designed by Sir Francis Johnston, one of Ireland’s leading architects, who also built the General Post Office and the Chapel Royal (Dublin). The distinctive feature of the castle is the architecture, especially the spectacular ceilings. The most impressive one (dining room) was designed by William Morris in the 1890's, a well known stencil artist of this time. The Castle remanined uninhabited from 1912, during the difficult years of the Independence War and the long years of economic severity which followed. By 1968 the roof had been removed. It had become a part of "Vanishing Ireland" until finally work on its restoration was commenced by Michael McMullen in 1971 and later by Constance Heavy-Seaquist and Bonnie Vance. Nowadays the castle is run by the charity "Charleville Castle Heritage Trust" which was created in 1994. The Charleville Castle Heritage Trust is a voluntary non-for-profit organisation (a company limited by guarantee registered in Ireland and charity - NGO) managed by Dudley Stewart with a team of core volunteers. The day-to-day running is handled by volunteers, who come from different countries including France, Canada, the United States of America and the United Kingdom, as well as other parts of Ireland to help out at the castle. The aims are the restoration and the sustainable conservation of the building. The castle is the direct outcome of grand and magnamous ideas following the brutal suppression of a terrible and bloody insurrection which engulfed Ireland in 1798 and almost caused the collapse of the British Monarchial System. It was built around the concepts of hope, belief in the future and humanity - on the fronteers of civilisation. This is its heritage - these are the values which are preserved within this great edifice. These are the ideals underwhich the ethos of volunteership have been developed, and are sustained, in modern times - Global sustainability, Peace and Betterment of life on Eart - a vision deep into the far off future. The History of Charleville Castle In the 6th century, these lands were part of an ancient monastic site of Lynally, which itself was an ancient Durrow monastic settlement. Later, in the early days of Ireland's colonization, when the city of Dublin felt threatened by the wild tribes of the West, these lands became the focal point for the first Stuart, and later more violent Elizabethan, plantations. Charleville Castle stands in an ancient Oak-forest site on lands that were once part of an estate which began to be assembled following on from a gift of 1,700 acres to the Moore family, made in 1577 by the Queen Elizabeth I. A member of the Moore family was raised to the Earldom of Charleville, but the title lapsed in 1764 due to the lack of heirs in the direct male line. The lands, however, were eventually inherited by the six-month old infant Charles William Bury, born into Co. Limerick land-owning family, who was importantly, also a grand-nephew of the last Earl. Tullamoore in these times was a village generally featuring thatched roofs and was largely destroyed by fire in 1785 as result of an hot-air balloon being mismanaged during the 21st birthday celebrations of Charles William Bury. The rebuilding of Tullamoore on an improved plan and scale, with wider streets and more substantial buildings, was sponsored by the trustees and estate of Charles William Bury. Charles William Bury was created Baron Tullamoore in 1797, and, as a man of considerable wealth, joined into a fashion of castle building by engaging the services of the renowned architect Francis Johnston in the planning of castle to be built near Tullamoore. 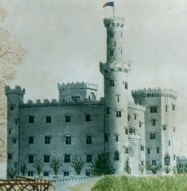 The construction of Charleville Castle commenced in 1798 and over the subsequent fourteen years, some fourteen hundreds man-years were involved in the building of what many consider to be the finest neo-Gothic castle in all Ireland. The wonderful craftsmanship involved being mainly due to the skills of Irish people. 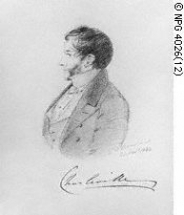 Charles William Bury was raised to the restored Earldom of Charleville, as first Earl of the second creation, in 1806. In 1833, Tullamore, having expanded greatly in population and wealth due to being a terminus of the Grand Canal, was recognised as the county town of the then King's county in preference to Philipstown which had performed that role since the times of Philip and Mary. The Charleville Estate extended to some 24,000 acres at its zenith but changing fortunes and changing times brought with them new ownership for most of these lands. Amongst the refurbishments to the castle which took place in later years were the addition of stencilling, designed by the celebrated William Morris, to the dining room in the 1890's. The Earldom lapsed again for want of heirs in 1885 with the estate passing to the ownership of a niece - Lady Emily. On Lady Emily's marriage some years earlier, the family took the name Howard-Bury to comply with certains terms in the title deeds of the Estate they seemed due to inherit. Colonel Charles Kenneth Howard-Bury, a son of this marriage, was notable as an explorer and amateur botanist in the Himalayas. Colonel Howard-Bury, who had twice escaped from prisoner of war camps during the recent "Great War", was sufficiently recognised as an explorer, linguist and dipomatist, to be appointed leader of the first expedition which set out to climb the Mount Everest in 1920-1921. Whilst Colonel Howard-Bury was not himself actively involved as a climber, George Mallory and other members of the expedition team reached some 23,000 feets without benefit of oxygen cylinders or other more recent sophistications in equipment. This expedition, which received an enormous public following, effectively provided survey information invaluable to subsequent expeditions and established the North Col route as the route of choice for several early attempts on Everest. The surname Howard-Bury is reflected in the latin name of a plant brought back from the Himalaya region by the Colonel. A room in the Royal Geographical Society in London is named in honour of Colonel Howard-Bury. Following on from this expedition to the Himalayas, the Colonel won a seat in the House of Commons. A later attempt was made at involvement in political life in the Irish Legislature. Although Colonel Howard-Bury inherited Charleville Castle on his mother's death in 1931, it was left with only a nominal caretaker staff. Indeed, some years earlier, the Colonel had inherited the smaller and more manageable, but exquisite, Belvedere House near Mullingar - in later years, the Colonel also spent most of his time on an estate he had purchased in North Africa. Upon the Colonel's death in 1963, the castle became uninhabited and even has its roof deliberately damaged as a device for the avoidance of paying high local property levies. Given the condition of the roof, the authorities agreed to deem the castle as being a ruin. During the later 1970's, the long term lease of the castle was taken up by persons who deplored the state into which the castle was falling and a move was made towards turning the tide of neglect and disrepair. 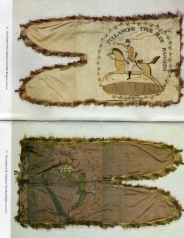 Modern day Irish craftmen with traditional skills have subsequently been involved in a gradual and loving restoration. Fortunately, some of the finest features of the castle (The Gallery, The entrance Hall, Main Staircase and Landing, The Library, The Morning Room and The Dining Room) did not suffer critical damage in the interim. In an effort to prevent the US Invasion of Iraq, in 2001 the sedona Confernce met at Charleville castle in Ireland with International delegates from US and Arab countries under the chairmanship of irish foreign Minister Brian Cowen TD. The Official Mission Statement of Quest Charleville Castle Ireland set out in the year 2000 to defy Global trends towards war and poverty and place peace and sustainability uppermost for human well-being through international action learning, collaboration, shared heritage, uniting people across the Globe .. invite others to join us - seeking to join you in the quest to change the future and work to steer a safe course through the challenges that lie ahead - Global Warning, Population Explosion, Urbanisation, Militarism, Political Corruption, Poverty, Malnutrition, Epidemics, Gainful Employment, fare access to global resources and the means to enjoy life for all.